Mail4Rosey: Ahoy! It is the Perfect Time to Buy a Playmobil Advent Calendar! Ahoy! It is the Perfect Time to Buy a Playmobil Advent Calendar! Are you doing shopping the day after Thanksgiving? If so (or if not, this could be a wonderful exception), what better gift to pick up to help heighten the sense of adventure than a Playmobil Advent Calendar? Kids LOVE being able to count down the days until Santa arrives, and you'll enjoy watching how excited they get to do it (I'm predicting my son will want to open a window first thing each morning, even before he gets up to brush his teeth). 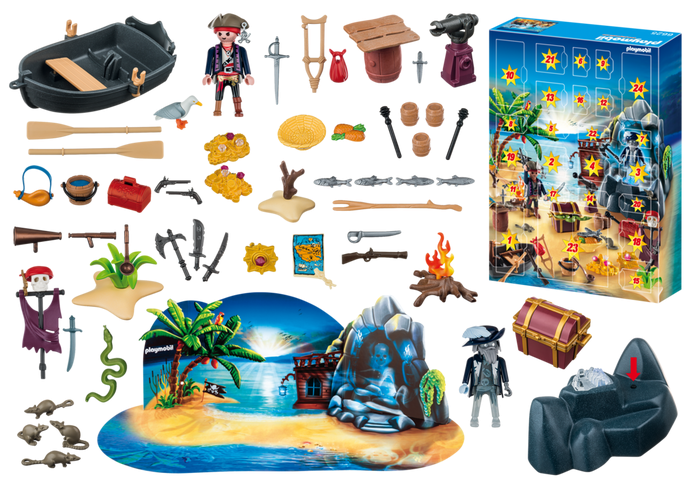 One example of a treasure you will find in this Advent Calendar is a Glowing Pirate! The Pirate Treasure Island theme is a sure bet in our house, with my pirate-loving boy, and honestly I'm thinking it's a pretty great selection too (not just because I like to say Ahoy There' Matey in my best pirate accent either, though that is certainly part of the charm). ;) This Advent Calendar will run you about $25, which is about a dollar a day if you start the countdown on Dec. 1! The items inside will last long after the holidays though, and be great additions to your children's existing Playmobil Sets (or a great way to introduce Playmobil if this will be their first). 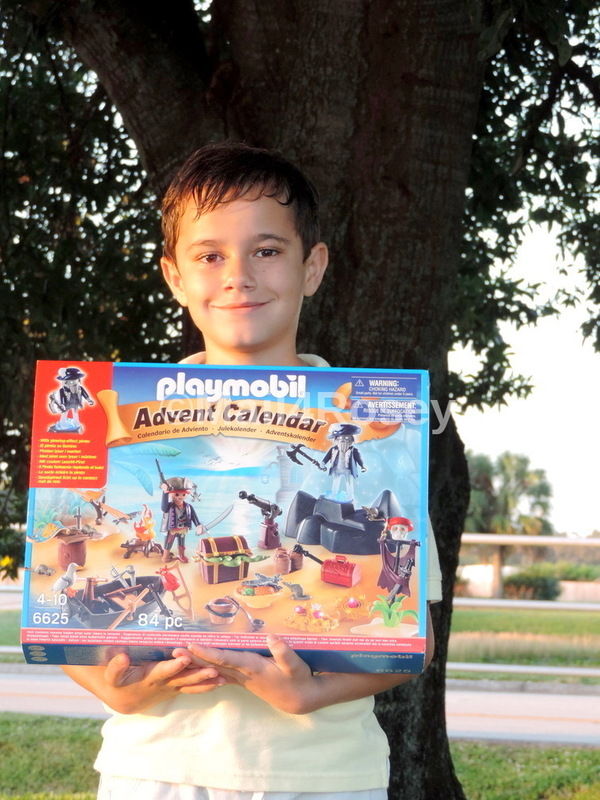 Each door opens to reveal a sturdy plastic Playmobil piece that goes with the calendar theme. If you dont want kids to know what's inside, remove the cardboard slip-on sleeve that comes on the outside of the box when you buy it. This is my son's first Advent Calendar (outside of a little cheap dollar store one we had a couple of years back that wasn't really any fun because the chocolate was icky) and he is GEEKED! He already has that young child's excitement and anticipation towards the holiday, but this increases it tenfold. It makes him happy, and so of course it makes me happy too. 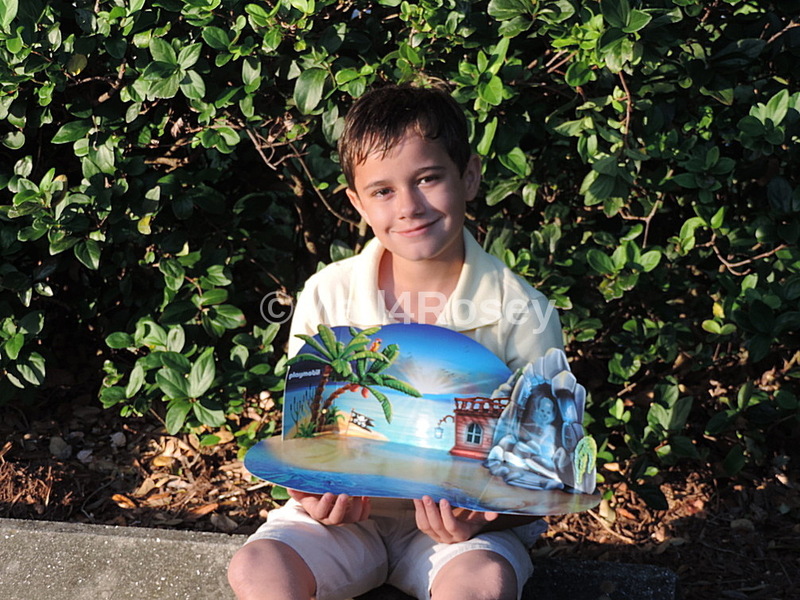 Cardboard stage to display items as you reveal them. Inside this kit you will also find a cardboard stage/back-drop where your child can play or put his/her pieces (as they are revealed) on display. This Advent Calendar is an awesome item to purchase for the season, no matter when you get it, but wouldn't it be just perfect to get it right now? 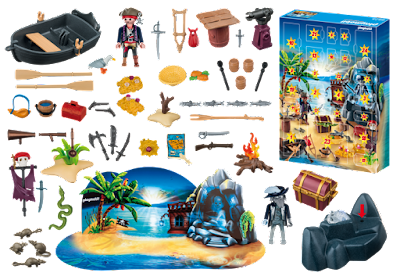 You can learn more about the Advent Calendars and other items from Playmobil by visiting their website. You can also follow them on Facebook and/or Twitter. This is definetly the right time for Advent Calendars, they make so many different types. This particular one locks very cool and I think it would make any little boy very happy. That is neat indeed. Would sure be good this time of year. I got my girls one of those chocolate filled advent calendars and they also thought it was yucky. Really ruined the holiday fun a little. I think this advent calendar looks like a lot better of an option! There are so many fun advent calendars out there these days! My little sister would absolutely love this! Well, it might not be a typical Christmas theme, ha!--but it is cute. My youngest nephew would love it. I remember the year when my son was completely obsessed with pirates! lol He would have loved this then. I love advent calendar for kids! All of them are pretty cool. This one's the best choice for pirate fans! This is so cool! I love advent calendar and this looks like a fun gift for Christmas. I know my son is going to love this. I saw that in one of my local shops and it put a smile on my face. Happy Holidays Rosie!